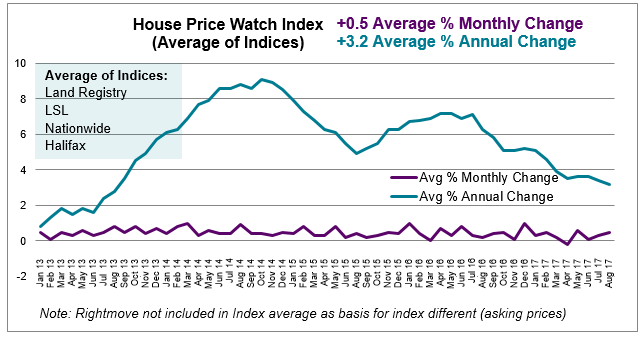 Across the major indices, house prices are up on average 0.5% in the past month and up 3.2% on average in the past year. The trend shows a slowing of annual house price growth. Activity and monthly house prices up. Pace of annual house price growth slows. 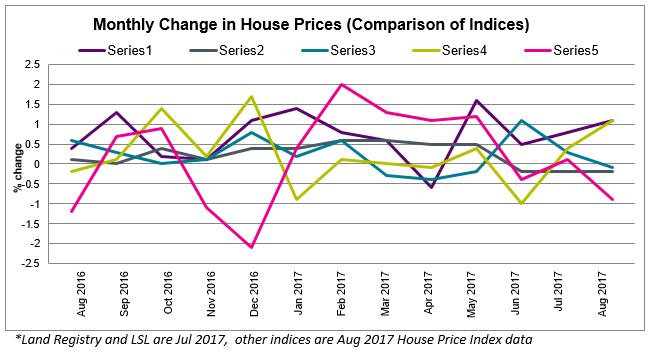 The major house price indices differ as to whether house prices are up or down over the last month. Land Registry (1.1%) and Halifax (1.1%) say monthly house prices are rising. 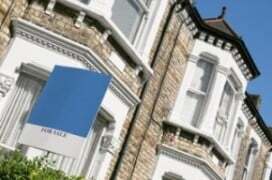 Nationwide (-0.1%), LSL (-0.2%) and Rightmove (-0.9%) say monthly house prices are falling. Land Registry and LSL refer to July house price data. Nationwide, Halifax and Rightmove refer to August house price data. Home sales and mortgage approvals pick up in July. After several months of slowing housing activity, UK home sales increased in July — up 1.3% between June and July 2017. Transactions are also 8.3% higher than July 2016. Home sales from July 2016 may have been affected by a slowdown following the result of the EU referendum. (HMRC seasonally adjusted figures). Mortgage approvals for house purchases, which are a leading indicator of completed house sales, are also up between June and July – up 5.2% — the highest level since January of this year. Shortage of homes for sale is putting upward pressure on house prices. 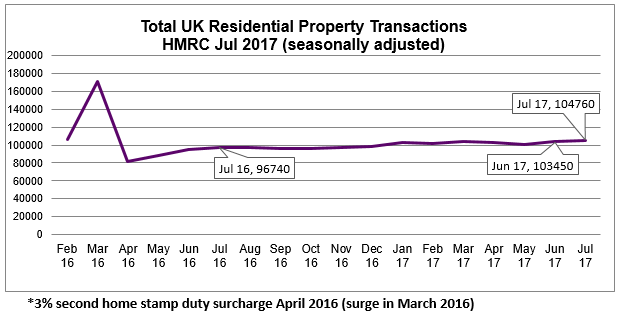 The August 2017 RICS UK Residential Market Survey reports little change in buyer enquiries in August. New sales instructions are down (although the drop in instructions appears to be stabilising now). 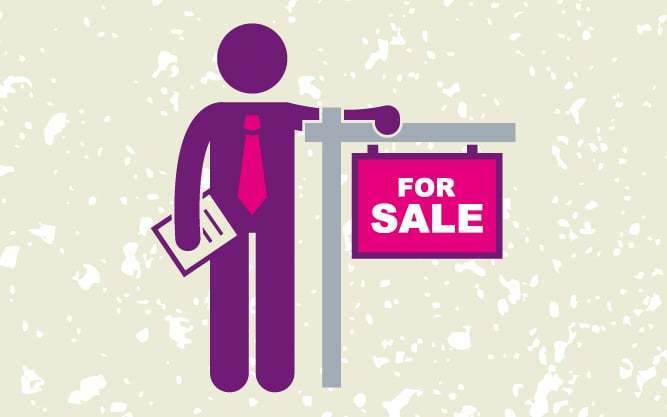 Average stock levels on estate agents’ books have declined for the 17th consecutive month leaving the homes available for sale at an all-time low. 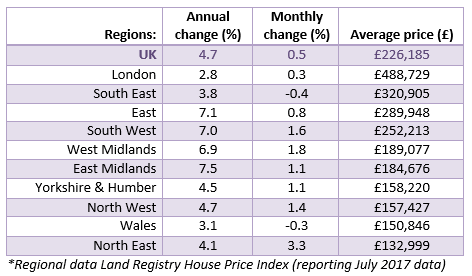 House prices increased in many parts of the country in the past month with the biggest rise in the North East (+3.3%). The rate of annual house price growth varies significantly across the UK. The East Midlands (7.5%), the East of England (7.0%), the South West (7.0%) and the West Midlands (6.9%) are experiencing the highest rates of annual house price growth. Annual house price growth continues to be depressed in London (2.8%). Other regions with slower annual house price growth include Wales (3.1%) and the South East (3.8%).